BHOPAL: The controversy over Godse's temple refuses to die. While Congress took out a candle light march to protest the installation of idol in Gwalior, BJP leaders also condemned it. Most of the senior BJP leaders including state ministers came on record and said that it was wrong to build the temple and offer prayers. 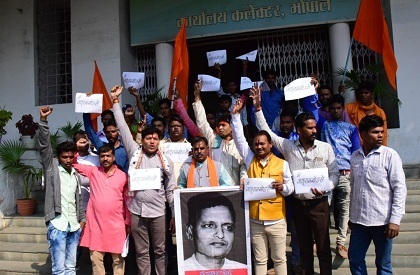 However, in a fresh development, Godse's supporters also came out on the streets in Bhopal. They staged a demonstration at the Collector's office. The Hindu Mahsabha said that they would oppose any action taken against the installation of the idol. The Mahasabha has also threatened that its members would go for self-immolation if the idol was removed. The Gwalior district administration has issued a notice to the Mahasabha in this regard. Some Mahasabha leaders have threatened that they would remove Gandhi idols, if the Godse temple was shifted or idol removed.